Deserts are really one of the most beautiful places in the world. They have some crazy and exotic features that are (mostly) interesting, breath-taking, and can also be used by us. Here are just sneak-peeks to these places. Many think that deserts are made of sand. But do you know that sand covers only about 20 percent of the Earth's deserts? Most of the sand is in sand sheets and sand seas. Deserts' soils may be also composed of pebbles, cobbles, gravel, layers of clay, silica, salt and gypsum, or even just ice. An example of a desert with sand is Australia's Simpson Desert, with salt is Bolivia's Salar de Uyuni, and with ice is Antarctica. A hamada is a type of desert landscape consisting of largely barren, hard, rocky plateaus, with very little sand. It is rocky desert, or desert region, which does not have surficial materials and which consists mainly of boulders and exposed bedrock. Two basic types occur: stony hamada, jaggedly developed across crystalline rocks; and pebbly hamada, cut across sedimentary material and mantled with bedrock fragments. An erg is a broad, flat area of desert covered with wind-swept sand with little or no vegetative cover. It is also called a sand sea or dune sea. Strictly speaking, an erg is defined as a desert area that contains more than 125 square kilometres of wind-blown sand and where sand covers more than 20% of the surface. Smaller areas are known as "dune fields". The largest hot desert in the world, the Sahara, covers 9 million square kilometres and contains several ergs, such as the Chech Erg and the Issaouane Erg. Approximately 85% of all the Earth's mobile sand is found in ergs that are greater than 32,000 square kilometres (12,000 sq mi). This desert feature is very beautiful, undulating dunes resembling ocean waves "frozen" in an instant of time. So it is no surprise that is commonly seen in the setting of some great movies! In deserts, although they generally receive very small precipitation, there can be rare occasions where flash floods can happen. But this flash floods can be particularly dangerous because they can deliver an enormous amount of water in a very short time. This happens because these rains often fall on poorly-absorbent and often clay-like soil, which greatly increase the amount of runoff that rivers and other water channels have to handle. From the driver's perspective, there may be clear weather, when unexpectedly a river forms ahead of or around the vehicle in a matter of seconds. After a long day of hiking in the dunes, if you get lucky, then you can find a lush area with a pleasant spring and surrounding it are flourishing trees and healthy vegetation in the middle of the desert; have some shade, a drink, and a cool nap. May be you will think this is just fiction, but actually this is true. 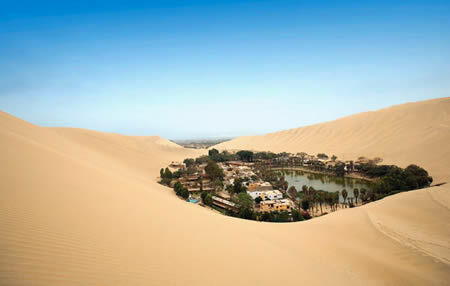 There are quite a number of oases in deserts, the notable ones are Huacachina oasis in Peru, which is known as the "Oasis of America," and the M'zab oasis in Algeria. But how can there be an oasis in a desert? It is actually a spot in the desert where the elevation is low enough that the water table is right underneath the surface, resulting in the presence of springs. Even in a desert, it rains occasionally, and this produces a water table just above the bedrock, usually several hundred feet below the surface. Sand is very porous, so most water runs right through it and down to the bedrock. Deserts are very rich in mineral resources. These are formed, improved, or preserved by geologic processes that occur in arid lands as a consequence of climate. Ground water leaches ore minerals and redeposits them in zones near the water table. This leaching process concentrates these minerals as ore that can be mined. Evaporation in arid lands enriches mineral accumulation in their lakes. Playas may be sources of mineral deposits formed by evaporation. Water evaporating in closed basins precipitates minerals such as gypsum, salts (including sodium nitrate and sodium chloride), and borates. The minerals formed in these evaporite deposits depend on the composition and temperature of the saline waters at the time of deposition. The Atacama Desert is unique among the deserts of the world in its great abundance of saline minerals. Sodium nitrate has been mined for explosives and fertilizer in the Atacama since the middle of the 19th century. Nearly 3 million metric tons were mined during World War I. Valuable minerals found in arid lands include copper in the United States, Chile, Peru, and Iran; iron and lead-zinc ore in Australia; chromite in Turkey; and gold, silver, and uranium deposits in Australia and the United States. Nonmetallic mineral resources and rocks such as beryllium, mica, lithium, clays, pumice, and scoria also occur in arid regions. Oil can also be found in these places, but it is not really true that there are more oil in deserts than other places. It may be just coincidental because it is principally found in large sedimentary basins located at or near recent or ancient continental margins. This is where the maximum amount of sediment will aggregate into thick, structured and organic rich detritus with ample reservoir quality rock. The most prolific oil reservoirs are generally located at the mouths of the world's largest rivers in deltaic complexes. One of the main "events" of the desert that one must not miss is the amazing rock formations it has. Rock formations form due to weathering, which is a group of processes by which surface rock disintegrates into smaller particles or dissolve into water due to wind, flowing water or heat. They maybe formed through physical or chemical weathering, or both. Rock formations here can be arches, towers, "houses" or just a spectacle of defying gravity.